Is that a Ganlow or a Gondola I see before me? Those of you who are not "in the know" are wondering at that heading but the boat under the arch of the bridge is known as a "Ganlow" and allegedly they were based on the Gondola! The Shannon must have been at full tide to have the water so calm at that point of the river! 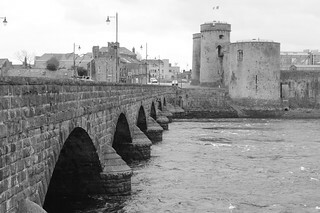 the NLI sleuths must be doing Xmas shopping, hopefully this pretty scene of Limerick won't go into the "less than five comments" folder ! Hello, Morning Mary! If you're still taking questions although it's afternoon, I'm intrigued by the Ganlow. Is that a local name for it? 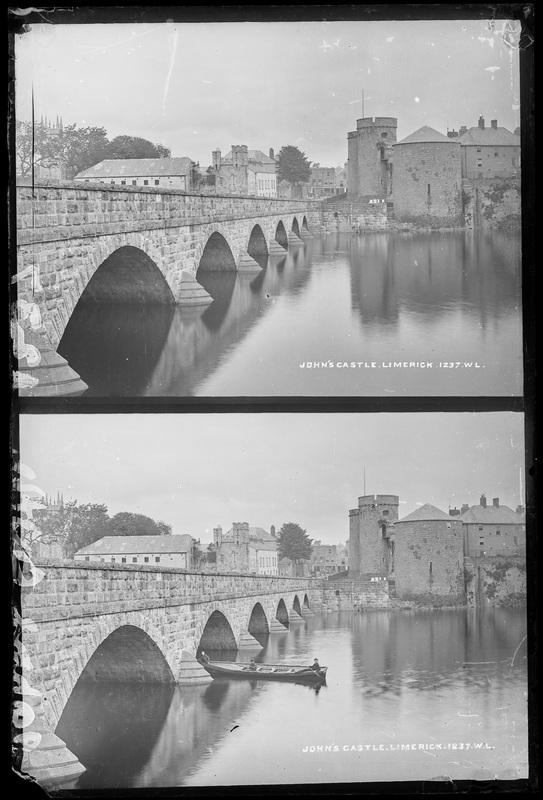 [https://www.flickr.com/photos/beachcomberaustralia] That is the new position of the Treaty Stone which is perhaps 15 to 20 yards further downriver from the old position which was just on the corner of the bridge and Clancy Strand. Given the angle I think that the shot may have been taken from there? There is a set of steps just beside the new location and it just might have been from the top of those???? I thought both halves of the Eblana collection were supposed to be identical (for speed of processing?) obviously this one does not fit the bill. I have mobile interwebs on my portable telephone!